I have been using different beers in my bread for a while now. I think the liquor adds an intense flavour and a malty twist to my bakes. Beetroots are in season at the moment and I think this recipe is a great way to combine the two. This flatbread is a delicious addition to any meal or served on its own as a tasty snack. Add in the oil and the beer (you may need a little more, or a little less so add it slowly) and mix to form a smooth dough. Knead for a few minutes until soft and elastic. Cover with cling film or a tea towel or a shower cap and leave to prove for about an hour. Whilst it proves, lightly oil a baking tray and pre heat the oven to about 200 degrees C.
Spread the dough onto the baking tray, with your hands, until it pretty much reaches the edges. Cover with your toppings and leave to rest for 5 minutes. Bake in the oven for around 15 minutes (you are looking for the edges to be golden and hard), remove from the tray and serve. For a twist you could add goats cheese instead of camembert and even red onions too. As winter closes in, I crave a darker, more flavoursome loaf, to enjoy toasted or dunked into a steaming hot bowl of soup on a cold night. Rub the yeast into the flours and the add the salt to the opposite side of the bowl. Add the oil and most of the water (how much you will need will depend on your flour). Knead to form a smooth dough (spelt doesn't need working as much as normal wheat flour, so a couple of minutes will do). Cover with clingfilm or a tea towel (I actually use a shower cap) and leave to prove for about an hour, or until nearly doubled in size. When risen, shape into a tight ball and leave to prove again, until nearly doubled in size. Preheat the oven to about 200 degrees c and slash a cross (or any shape you like) onto the top of the loaf. Bake for around twenty minutes or until it sounds hollow when you tap in on the base. Great toasted with peanut butter. Can be wizzed up in a processor with some sea salt and rosemary to make bread crumbs if you find you have any left that has gone stale. This is my twist on the classic tea-time treat. 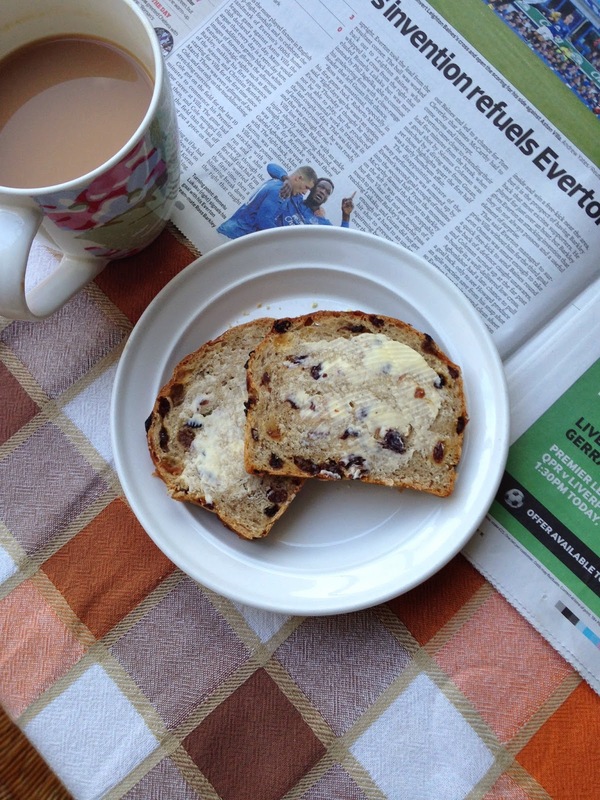 I have turned this traditional cake into a fruity loaf with a zesty edge. Perfect toasted on a cold afternoon, with a lick of butter. Soak the lady grey tea bags in about 300ml of boiling water and leave to cool. Rub the yeast into the flour and add the salt to the opposite side of the bowl. Add the oil, mixed spice and sultanas to the flour mix. Add the cooled tea mixture (take the tea bags out) slowly (you will not need all of the water, probably only about 200ml of it, but it will depend on your flour), mixing until you have the right consistency (should be not dry but not too wet and sticky). Leave to prove for about an hour, or until it has nearly doubled in size. Whilst the dough is proving, prepare your loaf tin by greasing it with butter. Once the loaf has risen, shape it into a small rectangle and slide it into the tin. Leave to prove again, until it has nearly doubled in size. Preheat the oven to about 200 degrees c.
When the loaf is ready, bake for about twenty minutes (or until it comes easily out of the tin and has a hollow sound when tapped on the bottom). Leave to cool and serve! This loaf is great for making french toast or bread and butter pudding if you find you have any left that's gone a bit stale. Often the greatest baking triumphs are born out of disaster. I had wanted to make a spectacular lemon curd and meringue tart for a while now, and after waiting patiently for an excuse to tackle it, I couldn't quite master the Italian meringue. After three attempts, and various swear words, all I was left with were some deflated egg whites and copious amounts of spun sugar that had attached itself to the bowl. I needed a desert, but my patience had worn thin. As the biscuit base was fine, I just needed something to fill it with. I thought of mixing the lemon curd with some double cream. The problem was I didn't have any, but I did have some creme fresh. The creme fresh actually worked better than double cream would have done. Combined with the lemon, it was a refreshing antidote to the rich biscuit base. 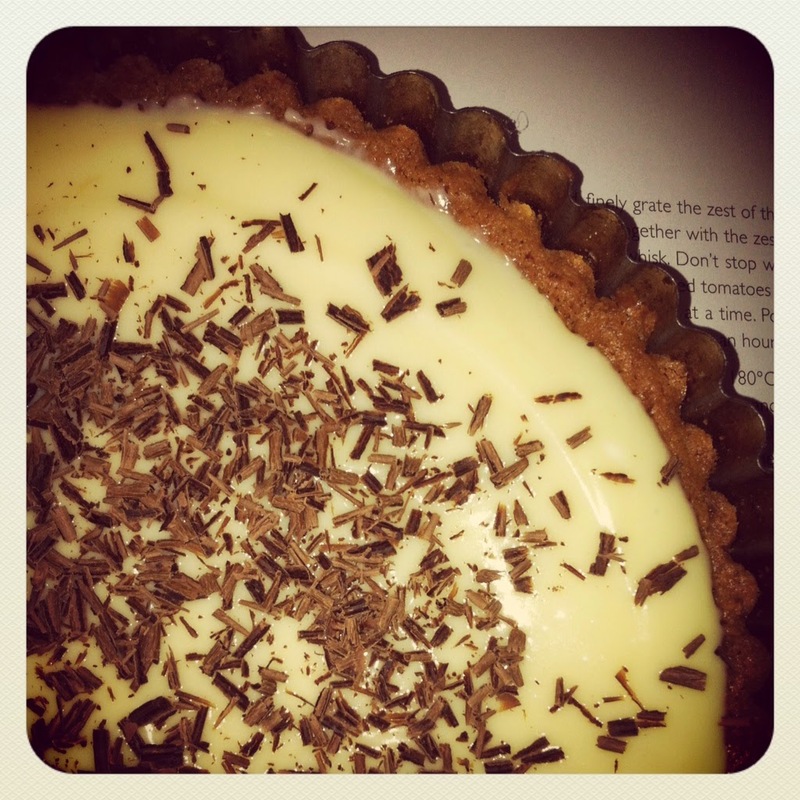 Even though it was an accident , I would definitely make this tart again. Combine 75g soft butter, the zest of one lemon, 75g brown sugar and 2 egg yolks until light and fluffy. Add 100g of plain flour and tsp of baking powder and mix thoroughly. Grease a medium size fluted tart tin and press the biscuit mix on the base and up the sides. Bake at 180 degrees c (150 for fan) for about 15 minutes (check after ten, you want in to be golden and not quite firm). Once the base has cooled, combine 100g of creme fresh with 200g of lemon curd (to taste). Add the zest of one lemon and spoon into the tart base. Grate some dark chocolate on top and leave in the fridge until chilled and ready to serve. Easy. Caramel slices are something that I bake when I am in need of a real sweet fix. I tend to make a big tray and then keep it in the fridge so I can greedily pick at them. I have been a fan of salted caramel for a while now (like a lot of other people) and I thought it might be a good idea to combine the two. My usual caramel slice recipe is delicious, but the caramel seems to never set properly. As enjoyable as it is to eat the gooey mess, its so hard to cut up, so I thought I would see if I could find a different method to try and solve the problem. 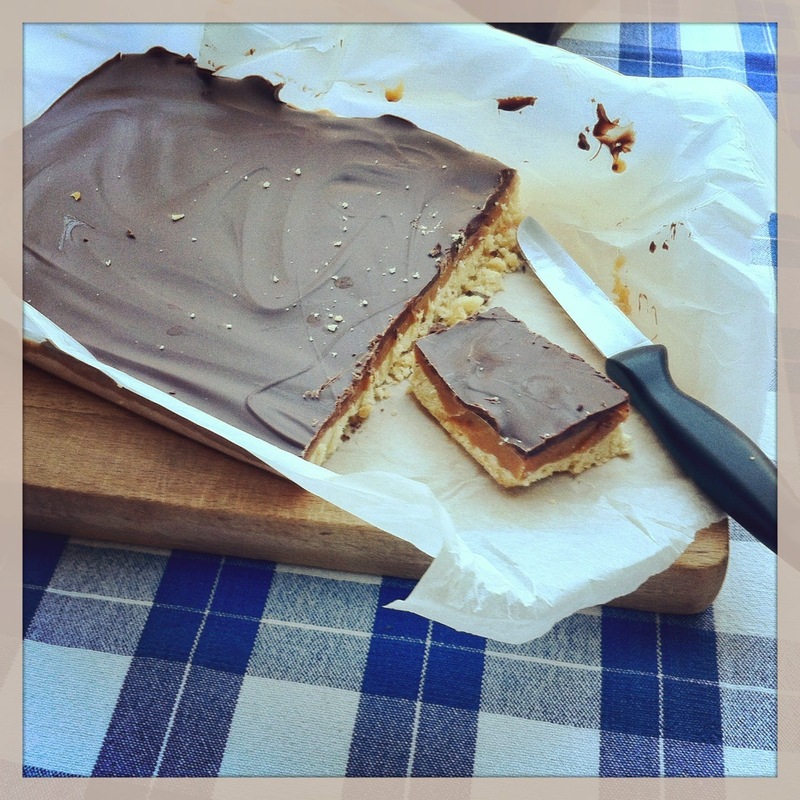 I was originally just going to search for a salted caramel that I could add to my slices but then I found this http://www.bbc.co.uk/food/recipes/salted_caramel_39300 salted millionaires shortbread recipe from Simon Rimmer. I tried this instead and I have to say it worked a real treat. Boiling the caramel instead of heating it slowly and then baking it (as my original recipe suggested) seemed to make the caramel a lot firmer. I did have to add more salt, but I think that was just my taste preference. All in all they were delicious. There's nothing I love more in life than a good loaf of bread. Whenever we get a new loaf in at work my first thoughts are 'How can I make this?' and 'How can I make this even tastier'. So when we got a light rye and cheese bread in a couple of weeks ago, I couldn't wait to get in the kitchen and come up with my own version. 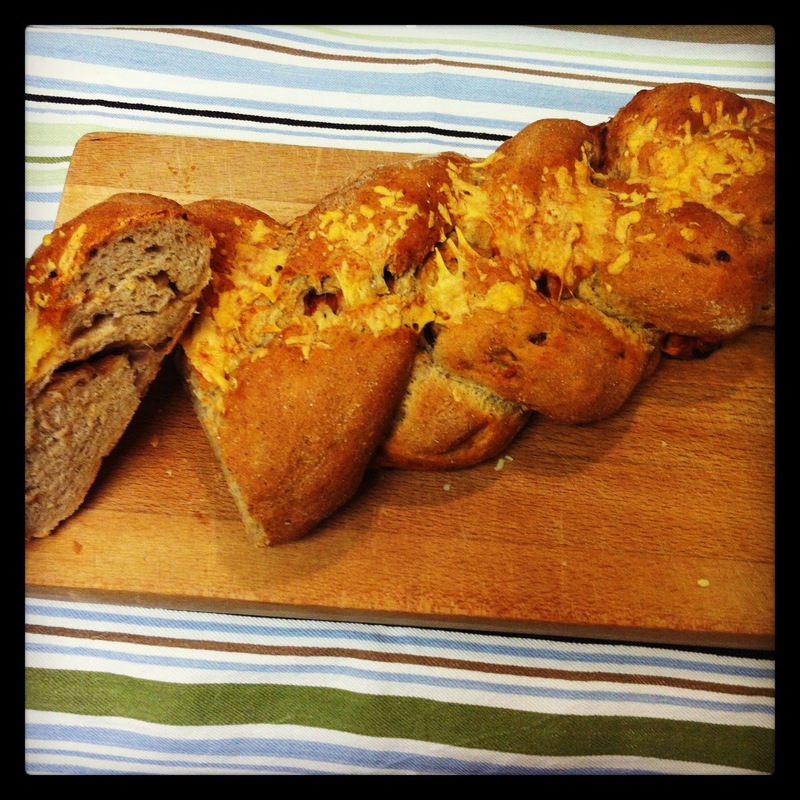 I had made a cheese and onion tear and share bread before and I thought these flavours would work well with the nuttiness of the rye. I think its good to take advantage of local produce, which is why I decided to go for Lancashire cheese. Its crumbly texture made grating easier too as it practically fell apart in my hands. 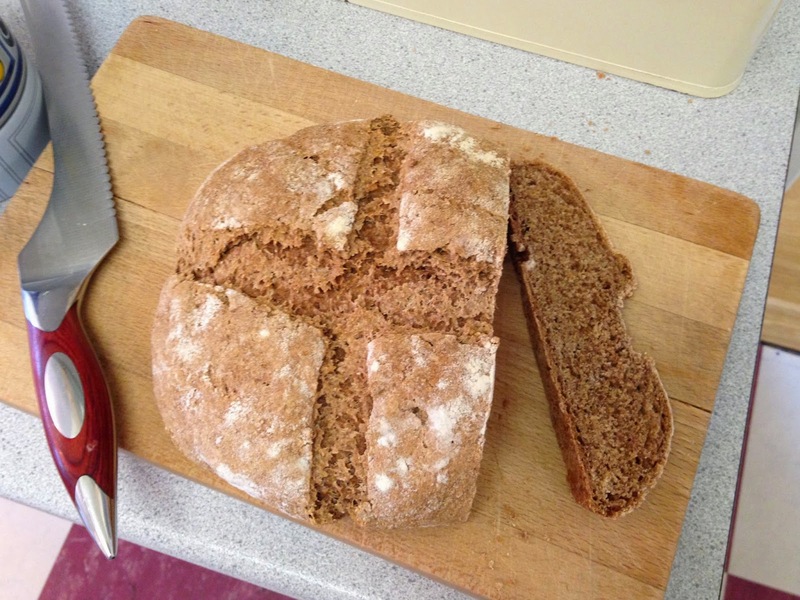 Rub 7g of dried yeast into a mixture of 300g of strong white flour and 200g of rye flour. Add a few pinches of salt, about 350ml of water (depending on your flour) and knead for around 10 minutes into a smooth dough. Leave to rise by half for about an hour (covered by some cling film, a tea towel or a shower cap). In the mean time, fry 2 onions until soft and set to one side to cool. Grate about 150g (to taste) of lancashire cheese and mix most of it into the cooled onion mixture (saving the rest for the top of the loaf). When the dough has risen, roll the dough out into a large rectangle and then put the filling into the middle. Roll the dough into a sausage shape and then cut into 3 equal pieces. Roll each of the pieces into long sausage shapes and attach together at the top. Plait them together, tucking the end piece underneath. Leave the loaf to rise by half. When the loaf is ready to bake sprinkle the top with the remaining cheese. Bake at 200 degrees for about 20 minutes and then leave to cool.